Bicep Tendonitis can be very resistant to healing because of the constant use of your shoulder and arm throughout the day. With every movement, you risk damaging the tissue further and making your injury worse. We know it's impossible to rest your shoulder and arm 100%. 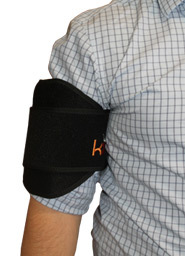 At King Brand® we have designed products that will help you relieve the pain of your Bicep Tendonitis and speed up the healing process. We also have products that will help you avoid further injury or strain while healing. Our products are there to help you heal at each stage of recovery. You can use them anytime, anywhere. ColdCure® for pain and inflammation. KB Support Tape™ to protect your injury. BFST® to heal torn or strained tissue. If you want to get rid of your Bicep Tendonitis as quickly as possible and return to your regular activities, use the ColdCure® and BFST® Wraps. If your Bicep is freshly aggravated (there is a lot of pain and/or inflammation present) you will want to start with ColdCure® treatments. In general, ColdCure® is designed to be used when you are experiencing the most pain. If you notice a flare-up of pain and/or swelling, this is the ideal time for ColdCure® treatments. You should use your BFST® Wrap when your pain and swelling subsides. For dealing with the swelling and pain associated with Bicep Tendonitis, nothing works better than cold and compression. Each ColdCure® Wrap comes with 3 swappable gel packs that have 3x more cooling power per lb than other products. An excellent value! Unlike other gels that are mushy and watery, our gel is firm but also flexible. ColdCure® gel packs contain 10x more gel than other packs, for maximum coverage of your bicep. And, the gel inside the wrap doesn't move around. It stays in place to ensure the effective treatment of your bicep. The gel packs are inserted inside the wrap one at a time, so you can have the other two charging in the fridge or the freezer to keep your cold therapy going. Do treatments in 20 minute intervals throughout the day, for as long as you need relief. The ColdCure® gel pack is enclosed in a soft, comfortable, quality neoprene wrap. It conforms to your bicep to ensure the injured area receives an even distribution of cooling power. All of our gel packs are custom designed for the shape of the body part they're intended to treat. Each body part is uniquely shaped, which is why all of our gel packs are uniquely shaped too. This means you're getting the best coverage and treatment possible. Other gel packs are notoriously famous for having hot and cold spots. When cold pressure is applied to a bicep with tendonitis, the gel starts to warm up in that specific spot faster than the rest of the pack. At King Brand®, our XC RigiGel® formula helps to distribute the cold energy evenly throughout the pack. The cold energy in our gel packs is transferred from the cold spots to the warm spots much more effectively. Yet another feature, this valuable improvement makes treatment much more effective, as your hot, swollen injury will receive the cooling power of the entire gel pack. The temperature-balancing power of this gel formula is unmatched. The BFST® Wrap is a diathermic device that stimulates blood flow deep within the soft tissue, providing nutrient-rich, optimized blood flow to your bicep. Diathermy is well-recognized and accepted by the medical community as an effective means of promoting sub-dermal blood flow in order to speed up healing and recovery times. Remember, our wraps are Registered FDA Medical Devices and Health Canada approved. BFST® is designed to be used when your Bicep is feeling its best. You don't want to use BFST® if you have a significant amount of pain and/or swelling. To reduce pain and swelling you want to restrict the blood vessels, not open them up. That is when cold is effective. Once pain and swelling are under control, it now becomes important to increase the circulation, or blood flow to your bicep to promote the healing. The more you can do this, the faster the healing. At rest, your bicep is not promoting blood flow. But activity can re-injure and cause pain and swelling. Our BFST® device promotes circulation and blood flow while you are at rest. Thus providing you with a safe and effective way to heal in comfort. BFST® Wraps come with a 3 level power controller. Everyone should start their treatments on Level 1 and work their way through the levels gradually as they heal. When you first start your treatments on Level 1, your bicep area may feel quite warm. This is because, at first, your circulation is poor. The more treatments you do, the less warmth you will feel. This is good. As the warmth lessens from treatment to treatment, this is an indication that your circulation is improving. Better circulation means blood flow all the time, not just during treatments. This is the goal. When you feel very little warmth during a treatment, it is time to move up to the next power level. Don't rush it though, more heat doesn't mean better treatment. In fact, less heat means better treatment, so take your time moving up in levels. We recommend 3-4 blood flow treatments per day. Each treatment is 20 minutes and the effects of each treatment last for up to 4 hours, so it's best to spread your treatments out over the day. This way you'll be receiving optimal blood flow all day long. Even once you feel healed, you should keep doing regular blood flow treatments in order to maintain your healing. Which Style of Wrap Should I Use for My Bicep? 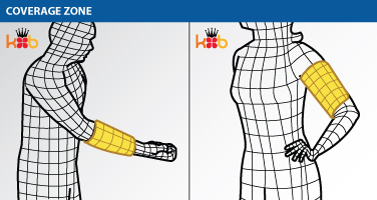 At King Brand® many of our products are designed for a specific joint or area of the body. Some products are designed to do "Double Duty". If you have Bicep Tendonitis you need to use our Leg Wraps. The Leg Wraps are versatile and can be used to treat several different areas of the body. They are very effective in targeting the bicep and provide maximum coverage of the area. Wrist Wraps may be ideal for you. The Wrist Wraps are versatile and can be used to treat several different areas of the body. Apply the Wrist Wrap to your bicep area for a perfect fit. Leg/Arm Coverage Zone for BFST® and ColdCure® Devices. The BFST® and ColdCure® Leg Wraps can be worn on your forearm or upper arm, depending on which part of your arm is affected. The BFST® Wrap will work to stimulate additional blood flow deep below your skin to help heal your damaged tissue. The ColdCure® Wrap will work to relieve the pain and swelling associated with your Bicep Tendonitis. 1. Find the Velcro® tab. 2. Fold the tab back on the wrap fabric. tab to the wrap fabric. 1. Find the Velcro® tab. 2. Fold the tab back on the wrap fabric. 3. Pull the wrap around your bicep. Your healing is important to us. At King Brand®, our customers receive free professional consulting services by our trained King Brand Advisors. This is a huge advantage in terms of your treatments and your recovery in general. Our Advisors can help you create a treatment plan that is unique to your schedule. They are extremely knowledgeable when it comes to treating Bicep Tendonitis. They have also been thoroughly trained on BFST® and ColdCure® technology and treatments. Our Advisors spend all day every day helping people just like you. They truly care about your recovery. One of our Advisors will contact you 4 or 5 days after your order has been delivered to see how your treatments are going and answer any questions you may have. 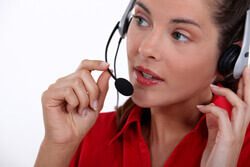 You are also welcome to contact us if you need any treatment advice or guidance. One of our Advisors would be more than happy to help you. Bicep Tendonitis can be an extremely painful and debilitating condition, causing you to turn to painkillers for some relief. Analgesics and NSAIDs such as ASA, acetaminophen or ibuprofen are often used to treat the pain but these drugs do nothing to treat the actual condition. In fact, analgesics and NSAIDs are known blood thinners and make the bleeding worse for fresh tissue injuries. Typical pain medications actually interfere with the healing process. Cortisone injections are used in extreme cases but these too are intended to address the pain. They do not promote healing of Bicep Tendonitis and they put you at a very high risk of further injury. Painkillers are dangerous because they stop the reminder of your Tendonitis, which is important if you want to avoid re-injury. By masking the pain, you risk overdoing it and making your condition worse. If you need relief from the pain, try limiting the use of painkillers to times when you are at rest. You can use painkillers to help you sleep. Using them when you are active is a recipe for permanent damage. Not all support tape is created equal. 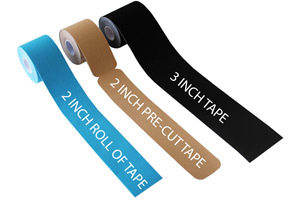 At King Brand®, our tape is medical tape, not athletic tape. This means our Tape is manufactured to ISO 10993 standards, which ensures that our Tape is made from extremely safe, biocompatible materials. Our Tape is actually made from safer materials than most baby products, including toys, clothing and even diapers. Don't let the big brand tapes fool you. Most of them are made from toxic materials, because there are no standards for athletic tape like there are for medical tape. Some big brand tape glues even contain carcinogenic ingredients. At King Brand®, your health and safety are of utmost importance, which is why KB Support Tape is manufactured to such high standards. While we found the above application to the right effective for Bicep Tendonitis, it is only an example. Please feel free to experiment with various Bicep Tendonitis taping applications to find the one that works best for you. The key is to use the pain as a guide. If you have pain in a specific area of your arm or shoulder, apply the Tape there. 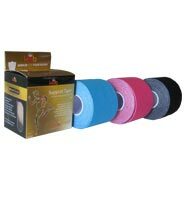 KB Support Tape is made of thin, stretchy, breathable material. It's so lightweight and comfortable you'll hardly even notice when it's on. It is designed to be applied any time you want extra support and protection for your bicep. There's no need to remove the KB Support Tape when you're doing ColdCure® treatments, as the cold will easily penetrate through the Tape. 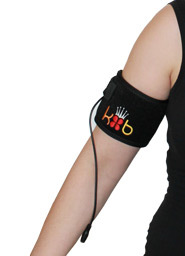 You can wear KB Support Tape during BFST® treatments (noting that with the BFST® there is a very slight loss of effectiveness during treatment due to the nature of the tape acting as a barrier). 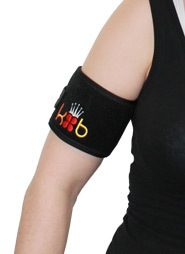 Our King Brand® Support Tape will target any injury effectively. 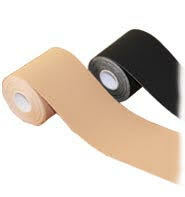 The Tape comes in two different widths, Pre-Cut Strips or a Continuous Roll, and choice of color. Order Now to Start Your Recovery Today! You can order from our secure online shop or give us a call toll free! If ordering online, click on the "Add to Cart" button for each product you would like to purchase. Please feel free to go to the checkout at any time. To place an order by telephone, call us at our toll-free number 1-844-400-2525 and one of our Treatment Advisors will be happy to place your order by phone. at 1-844-400-2525 to find the closest location. Feeling better is ready and here for you! Wear the ColdCure® Wrap as much as possible to relieve your pain and swelling and protect your Bicep from further damage. Avoid re-straining your Bicep as much as possible. Using KB Support Tape will help with this. Trying to rest your arm is hard, but it is very important if you want maximum relief. Do this and you can finally relieve the symptoms and heal your bicep injury! King Brand® ColdCure® and BFST® Wraps are FDA Registered medical devices. They have also passed the Health Canada, ISO 13485, ISO 10993 and IEC 60601-1 3rd Edition approval processes. These devices are not simple consumer goods. They are designed to prevent, treat, and cure soft tissue injuries and chronic conditions. Part of being an FDA Registered company means that our products are made from high quality, biocompatible materials. Our devices are actually made from materials that are safer than the materials used to make most baby products. These devices are manufactured and tested to the highest safety standards in the industry. Note from KB WebMaster - The text below is primarily intended to assist with Google properly classifying this page content. To learn more about our products please visit our website.<br>Bicep Tendonitis is also known as Biceps Tendonitis and Bicipital Tendonitis. Bicep Tendonitis causes include repeated overhead motions, degeneration with age and a direct injury to the shoulder. 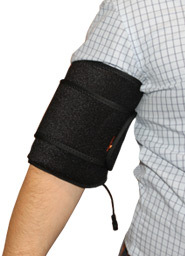 For Bicep Tendonitis, your best option is a ColdCure wrap. Shoulder injuries plague many people. A bad Bicep Tendonitis injury causes shoulder pain. There are many symptoms of shoulder pain caused by Bicep Tendonitis. For shoulder braces, you're better to buy a ColdCure Wrap. Bicep Tendonitis exerecises stimulate blood flow, but Bicep Tendonitis exercises can also lead to more injury because of strain the excercise motion puts on the muscles. BFST products promote bloodflow just like exercises and stretches only without the risk of re-injury. Treatment for Bicep Tendonitis will cause your shoulder pain to improve and your Bicep Tendonitis to heal. There's no doubt that to heal Bicep Tendonitis injuries quickly you need BFST treatments. Coldcure will help with shoulder pain. You can cure shoulder pain and Bicep Tendonitis with BFST and coldcure technology. So, if you want to heal your Bicep Tendonitis quickly, you need BFST. 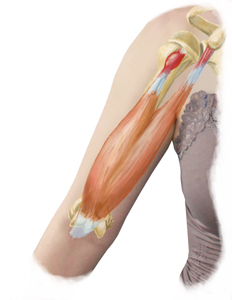 If you want to treat pain Cause by Bicep Tendonitis you need coldcure. Bicep Tendonitis symptoms are shoulder pain, numbness, inflammation and popping in your arm. Some Bicep Tendonitis injuries require surgery. This heals the Bicep Tendonitis but the pain in your shoulder after surgery can be severe. The best Bicep Tendonitis treatment is BFST. The best Bicep Tendonitis pain treatment is coldcure. These wraps are incredible. They feel comfortable. They work.